As an owner or operator of an underground storage tank (UST), you may have invested a lot of money in an automatic tank gauging system to detect leaks --- but are you getting your money’s worth? If you don’t operate your automatic tank gauging system (ATGS) effectively, you may be letting stored product leak into the environment. If so, you may face costly cleanups and liability actions. Also, you can be cited and fined for not meeting the Bureau of Underground Storage Tank Regulations’ (BUSTR) requirements for properly operating and maintaining an ATGS to detect leaks from USTs. Note that a simple ATGS will detect leaks only from tanks. To detect leaks from piping, you will need an ATGS that supports connection to line leak detectors. Know your ATGS. Insist that your ATGS installer trains you and provides clear instructions in the proper operation and maintenance of the ATGS. It is strongly recommended that you have a service contract with both the ATG company and the UST maintenance company if they are not the same. Make sure your ATGS is constantly on and plugged into the power source. This may sound obvious, but inspectors have written many citations when they discovered that the ATGS was turned off and not monitoring for leaks. Respond to alarms. Ignoring an alarm defeats the purpose for having the ATGS. Don’t ignore the “FAIL” alarm. Large leaks have gone undetected when operators ignored an alarm, disabled the alarm, or turned their ATGS off. Run your ATGS in its “test mode” at least once a month. You must test when the tank is relatively full. Since an ATGS does not detect leaks above the product level, test when the tank is as full as it typically gets (try testing soon after delivery, but after product settles). Also, you should test frequently. The more you test, the greater the likelihood you will detect leaks as quickly as possible. The earlier you detect a leak, the easier and less costly the cleanup. Have your ATGS maintained and calibrated according to the manufacturer’s instructions. Make sure you read the directions in the manual that came with your ATGS. Use the manufacturer or installer representative’s phone number to get answers to any questions you have about using the ATGS correctly. Don’t hesitate to contact the manufacturer or installer for help. Report problems. You must report test results indicating a leak to BUSTR within 24 hours. 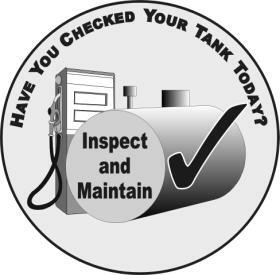 You do not need to report if the ATGS is found to be defective, is repaired immediately, recalibrated or replaced, and subsequent monitoring shows the tank is tight. You must immediately investigate and confirm all suspected leaks. When in doubt, report.
? Manufacturer supplied and written documentation of all calibration, maintenance and repair schedules.
? All written performance claims for your ATGS. This will usually be an evaluation document signed by a third-party evaluator showing how a sample ATGS performed under test conditions. Keep records either at the UST site or at a readily available site, and provide them for inspection upon request. Put ATGS monitoring in the most responsible hands. Do not rely on the vigilance of part- time or under-trained employees. If necessary, have ATGS alarms go to a central, 24 hour contact or use other mechanisms that put ATGS monitoring in the most responsible hands. Please note: Your ATGS must meet performance standards for minimum leak detection rates. Check the third-party evaluation for your ATGS to make sure your system will detect a leak of 0.2 gallons per hour with 95% probability of detection and 5% probability of false alarm. Ohio Revised Code 3737.92(D)(6) requires owners and operators to be in compliance with all UST regulations at the time the release was first suspected or confirmed to be eligible to make a claim against the Fund. BUSTR’s rules state that an automatic leak detection system must be installed, calibrated, operated, and maintained in compliance with the manufacturer’s instructions, including routine maintenance and service checks for operability or running conditions. Owners who do not heed the manufacturer’s instructions on the proper use of the leak detection systems or fail to operate and maintain the systems in proper working order can be cited and fined for improper leak detection. More importantly, Fund coverage can be jeopardized. The Petroleum UST Release Compensation Board, which administers the Fund, and BUSTR realize that many owners have spent thousands of dollars for ATGS. Protect your ATGS investment and Fund coverage by adhering to the manufacturer’s instructions and the proper operation and maintenance of the ATGS. Remember, it’s in your best interest that your ATGS works and detects leaks as soon as possible ------before leaks become big cleanup and liability problems. ü Trains you in proper operation of the ATGS. ü Demonstrates that the ATGS has been correctly installed and programmed for the tank it monitors. ü Gives you an operation manual, schedules and documentation for calibration/maintenance, third-party evaluation, and phone numbers for technical support. ü Schedules maintenance with you as required by the manufacturer’s instructions.